Here's your complete guide to every single Apex Legends Battle Pass reward. The debut Apex Legends Battle Pass is now finally live, having launched earlier today on March 19. 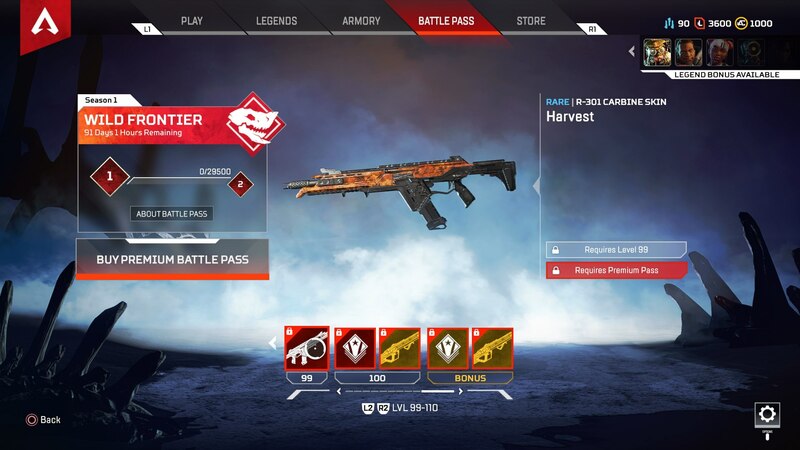 In this Apex Legends Battle Pass rewards guide, we'll be providing you with a complete list of all 100 reward tiers in the brand new Apex Legends Battle Pass, so you know exactly what you're going to be earning, as well as how you're going to earning it, throughout the season. However if you instead need any additional information on the debut seasonal event of Respawn's Battle Royale shooter, you can head over to our Apex Legends Season 1 guide. Here you can find all the information on when the season ends, and much more. Firstly, what is the Apex Legends Battle Pass? If you're willing to shell out 950 Apex Coins, you'll unlock 100 total reward tiers, which are known as the Battle Pass Tiers. These reward tiers offer items that can't be earned anywhere else in the game, such as weapon and character skins and quips. Season 1 of Apex Legends should be running for right around three months in total, so you've got until then to level up your Battle Pass and unlock all 100 rewards for the Apex Legends. Over on the official EA website, details about the Apex Legends Battle Pass were revealed. There are two versions of the Apex Legends Battle Pass: one that retails for 950 Apex Coins, and one that retails for 2,800 Coins. With the normal, cheaper version, you'll have access to all 100 reward tiers featured in the Battle Pass. But if you shell out for the version that costs 2,800 Apex Coins, you'll instantly unlock the first 25 tiers of the new Battle Pass. For a detailed look at all the rewards you'll unlock over the course of the 100 total tiers, carry on reading this Apex Legends Battle Pass guide. As we mentioned at the top of this guide, there are 100 total reward tiers for the Apex Legends Battle Pass. If you purchase the standard version of the Battle Pass for 950 Apex Coins, you'll have all 100 tiers to unlock, but if you purchase the upgraded version for 2,800 Apex Coins, you'll start out with the first 25 reward tiers already unlocked for you. Tier 1 - Lifelife skin, Mirage skin, Wraith skin. Tier 2 - Triple Take skin, Apex Pack. Tier 3 - Wraith Season 1 kill tracker. Tier 4 - Hemlock skin, Gibraltar Season 1 wins tracker. Tier 5 - Wild Frontier badge. Tier 6 - Bangalore quip, Pathfinder Season 1 wins tracker. Tier 7 - 50 Apex Coins. Tier 8 - Bloodhound Season 1 kill tracker, Wraith Season 1 win tracker. Tier 9 - Powler skin. Tier 10 - Wild Frontier badge, Bagalore Season 1 kill tracker. Tier 11 - 50 Apex Coins. 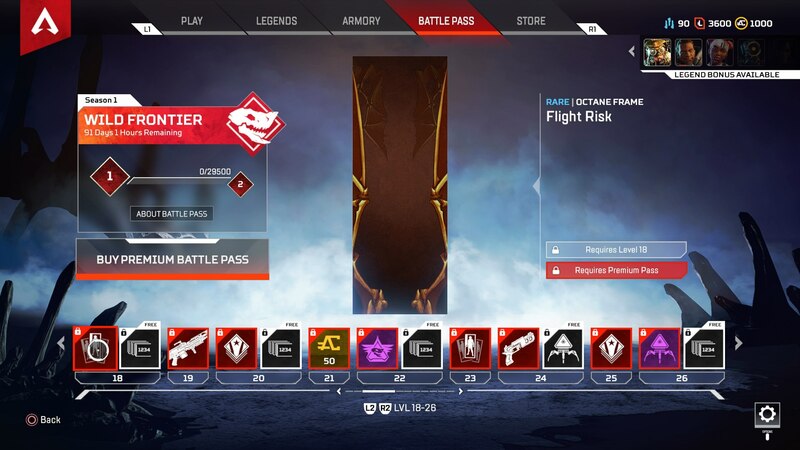 Tier 12 - Battle Pass Points boost, Apex Pack. Tier 13 - Mirage frame. Tier 14 - Longbow skin, Bloodhound Season 1 win tracker. Tier 15 - Wild Frontier badge. Tier 16 - Mirage quip, Caustic Season 1 win tracker. Tier 17 - 50 Apex Coins. Tier 18 - Octane frame, Mirage Season 1 win tracker. Tier 19 - Spitfire skin. Tier 20 - Wild Frontier Badge, Lifeline Season 1 win tracker. Tier 21 - 50 Apex Coins. Tier 22 - Battle Pass Points boost, Octane Season 1 win tracker. Tier 23 - Wraith frame. Tier 24 - Mozambique skin, Apex Pack. Tier 25 - Wild Frontier badge. Tier 26 - Epic Apex Pack, Caustic Season 1 damage tracker. Tier 27 - Pathfinder quip. Tier 28 - Mirage Season 1 kill tracker, Bangalore Season 1 damage tracker. Tier 29 - Kraber skin. Tier 30 - Wild Frontier badge, Gibraltar Season 1 damage tracker. Tier 31 - 50 Apex Coins. Tier 32 - Battle Pass Points boost, Bloodhound Season 1 damage tracker. Tier 33 - Pathfinder Season 1 kill tracker. Tier 34 - EVA-8 skin, Apex Pack. Tier 35 - Wild Frontier badge. Tier 36 - Caustin quip, Lifeline Season 1 damage tracker. Tier 37 - 50 Apex Coins. Tier 38 - Caustic Season 1 kill tracker, Octane Season 1 damage tracker. Tier 39 - Flatline skin. Tier 40 - Wild Frontier badge, Wraith Season 1 damage tracker. Tier 41 - 50 Apex Coins. Tier 42 - Battle Pass Points boost, Mirage Season 1 damage tracker. Tier 43 - Apex Pack. Tier 44 - Alternator skin, Pathfinder Season 1 damage tracker. Tier 45 - Wild Frontier badge. Tier 46 - Gibraltar quip, Apex Pack. Tier 47 - 50 Apex Coins. Tier 48 - Gibraltar Season 1 kill tracker, Octane skin. Tier 49 - Peacekeeper skin. Tier 50 - Wild Frontier badge. Tier 51 - Prowler skin. Tier 52 - Battle Pass Points boost. Tier 53 - Apex Pack. Tier 54 - Devotion skin. Tier 55 - Wild Frontier badge. Tier 56 - Wraith quip. Tier 57 - 100 Apex Coins. Tier 58 - Octane Season 1 kill tracker. Tier 59 - Mastiff skin. Tier 60 - Wild Frontier badge. Tier 61 - Lifeline frame. Tier 62 - Battle Pass Points boost. Tier 63 - 100 Apex Coins. Tier 64 - P2020 skin. Tier 65 - Wild Frontier badge. Tier 66 - Bloodhound quip. Tier 67 - 100 Apex Coins. Tier 68 - Lifeline Season 1 kill tracker. Tier 70 - Wild Frontier badge. Tier 71 - Bloodhound frame. Tier 72 - Battle Pass Points boost. Tier 73 - Apex Pack. Tier 74 - R-99 skin. Tier 75 - Wild Frontier skin. Tier 76 - Octane quip. Tier 77 - 100 Apex Coins. Tier 78 - Bangalore Season 1 kill tracker. Tier 79 - Wingman skin. Tier 80 - Wild Frontier Badge. Tier 81 - Gibraltar frame. Tier 82 - Battle Pass Points boost. Tier 83 - Apex Pack. Tier 84 - RE-45 skin. Tier 85 - Wild Frontier badge. Tier 86 - Legendary Apex Pack. Tier 87 - 100 Apex Coins. Tier 88 - Caustic frame. Tier 89 - Battle Pass Points boost. Tier 90 - Wild Frontier badge. Tier 91 - Pathfinder frame. Tier 92 - Battle Pass Points boost. Tier 93 - Apex Pack. Tier 94 - G7 Scout skin. Tier 95 - Wild Frontier badge. Tier 96 - Lifeline quip. Tier 97 - 100 Apex Coins. Tier 98 - Bangalore frame. Tier 99 - R-301 skin. Tier 100 - Wild Frontier badge, Havoc skin. Bonus - Wild Frontier badge, Havoc skin.